‘War for the Planet of the Apes’ is a striking, immaculately-realized and challenging film, a stunning technical achievement that took my breath away more than once, and a moderately disappointing ending to this remarkable trilogy. 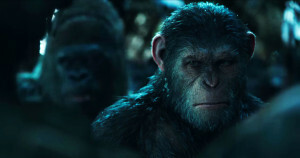 Rupert Wyatt’s 2011 ‘Rise of the Planet of the Apes’ took most people by surprise. I know it did for me. Hearing about a prequel to ‘Planet of the Apes’ starring James Franco didn’t really excite most people I spoke to. Reactions ranged from detached curiosity to mocking dismissal (I was the former.) Wyatt and screenwriters Amanda Silver and Rick Jaffa however delivered a surprisingly solid film with real heart, a fascinating story and a standout performance by Andy Serkis. Most impressive was the way it subverted expectations by placing the apes at the center of the story. I enjoyed it and wondered if there would be a sequel but paid it little mind afterward. 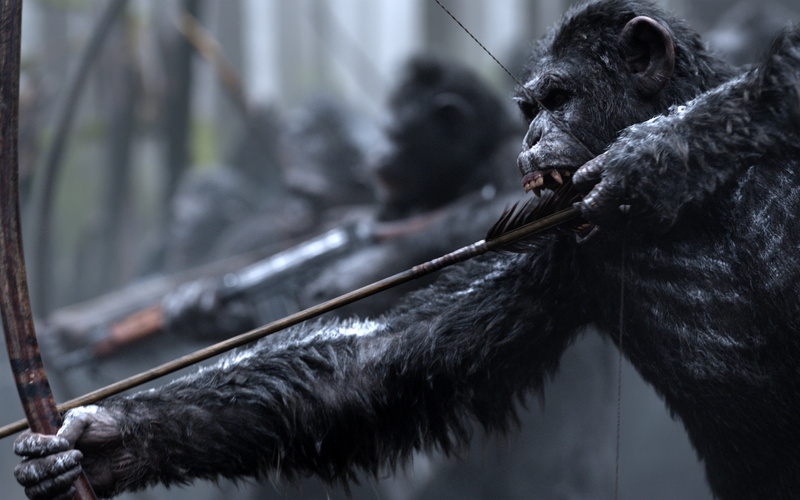 In 2014 the second film, ‘Dawn of the Planet of the Apes’ was released, and it is a marvel. Taking over the reigns was director Matt Reeves. Reeves’ previous films: the found footage giant monster movie ‘Cloverfield’ and ‘Let Me In,’ the American remake of a Swedish vampire film were both quite good, but I didn’t see anything in his skills that prepared me for the perfect execution of ‘Dawn of the Planet of the Apes.’ Here was the sequel to a film no one really took seriously that elevated the story to something more deeply profound than anything I could have expected. The filmmakers were almost all changed. Not only did Matt Reeves take over directing duties but The score for the second film is by Michael Giacchino and is one of my favorites. The cinematographer was the legendary Michael Serasin who shot ‘Angel Heart’ and ‘Harry Potter and the Prisoner of Azkaban.’ It seemed like the film was elevated at every level. Nowhere was this more clear than with the performances. Much has been made of Andy Serkis’s performance-captured role as Caesar and for good reason. He is absolutely tremendous. Also a standout in ‘Dawn of the Planet of the Apes’ was the villain Koba played by Toby Kebell. Of equal importance is the outstanding special effects crew headed by Joe Letteri and Dan Lemmon. I have seen some incredible special effects in film however ‘Dawn of the Planet of the Apes’ may have been the first time I actually couldn’t believe what I was seeing. The uncanny valley was gone. I was seeing real apes speaking on screen. These were special effects which were not showy, they were there to serve the story. So yes. I loved ‘Dawn of the Planet of the Apes.’ I felt it was a beautiful Shakespearian epic that led perfectly into the ‘Planet of the Apes’ mythos. And really, that’s the biggest problem I have with ‘War for the Planet of the Apes.’ It’s quite good. But it’s not as good as the last film. This conflict leads to Caesar separating from most of the apes and setting out on a quest with his closest and most-trusted followers. As this is a spoiler-free review I will steer clear of specifics but the quality of ‘War’ is absolutely on par with ‘Dawn.’ Almost the entire crew from the last film return here which makes the last two films in the trilogy a great pairing, but it also makes the trilogy feel a bit lopsided. The departure in both tone and quality between ‘Rise’ and the second two films means that ‘Rise of the Planet of the Apes’ exists in a strange position as being the unusual prequel to a perfectly-matched pair of films. This movie is less Shakespeare and more The Bible, at times seeming like a direct adaptation of the Exodus story. There is also a fair helping of ‘Apocalypse Now’ (a fact clearly not lost on the filmmakers as there is a prominently seen piece of graffiti saying “Ape-pocalypse Now.”) I won’t say much about Harrelson’s The Colonel but there is more than a little Kurtz in his performance. If we are to look at these films as a trilogy, I can’t help but feel like the last film was this series’ ‘The Empire Strikes Back': a dark middle chapter whose quality stands head and shoulders above the rest. But ‘War for the Planet of the Apes’ is no ‘Return of the Jedi.’ There are no Ewoks here. This film is a brutal treatise on the cruelty of war with very little joy to be had. The exception to this is Steve Zahn as Bad Ape, a zoo chimpanzee who joins Caesar and his band of crusaders. I also have to once again call out the special effects team at WETA. They achieved something truly special with the previous films and have managed to exceed that with their latest. There are languishing close-up shots of the apes’ faces that were truly awe-inspiring. My eyes would search every inch of the screen looking for seams or obvious signs of CGI and couldn’t find any. Eventually I just stopped trying and my mind accepted that I was seeing apes speaking on screen. This film is a technical marvel and is truly something to behold. This is a darkly beautiful film but it seems like a strange way to end the series. Perhaps it won’t be the end. Andy Serkis has been quoted as saying that there could be more films. I believe that if we get another film which more properly bridges the gap between the world started in ‘Rise of the Planet of the Apes’ and the Ape controlled planet of the classic films, I would be happier with this entry in the series. As a film I thought it was wonderful but as a final chapter in the story of Caesar I found it lacking.